One of the most effective things you can do to enhance your wellbeing is to improve the quality of your sleep. A good night's sleep makes you healthier, happier, and more creative. Includes Sound Asleep Bonus Edition (total is 2 guided tracks plus sound entrainment only track). To fully experience the potential of this program, please get comfortable, close your eyes and relax for the next 5 minutes. Allow the guidance and ambient music soundtrack to immerse you in a deep sense of relaxation and peace. 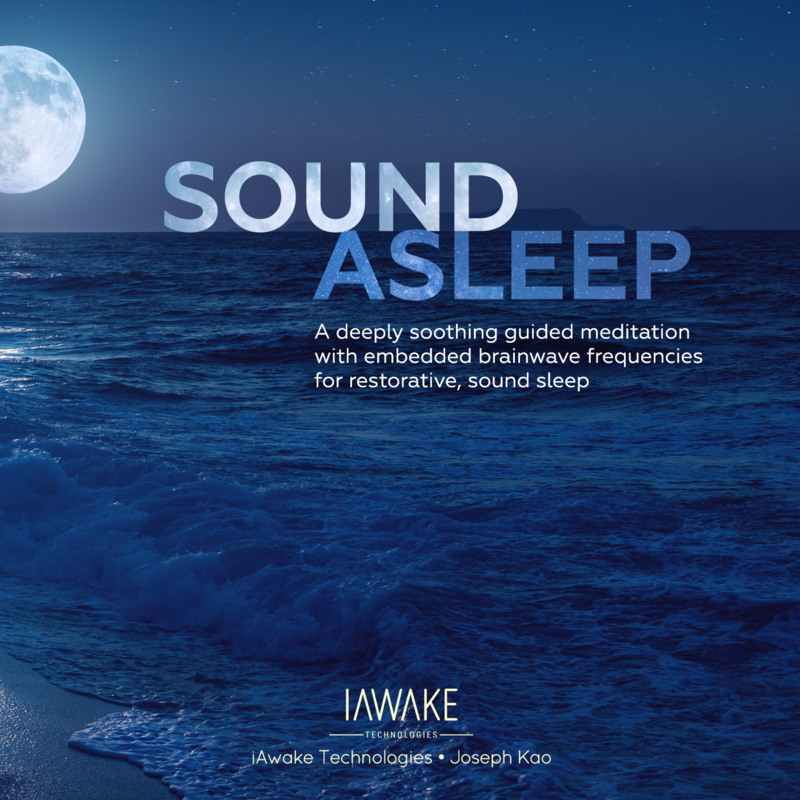 Don't be fooled - it is the integration of guidance, music, and the design and technology infused in the soundtrack that evokes the deep state of relaxation, trust, and sleep. "I think it's a great product for inducing calm and promoting sleep! Congrats!" "Using this program I noticed that I fall asleep a lot faster, sleeping longer and more refreshing." "I was asleep by the end of the two tracks, right. What more could I ask for? :)"
Track one has a soothing, hypnotic soundscape with embedded brainwave frequencies that guide you from the waking state into the deepest stages of sleep. As you listen, you’ll hear a slow countdown from 100, and distant, dream-like words and phrases, just on the cusp of your awareness, which subtly prime the brain for deeper sleep. Track two contains no words at all, just rich, resonant drones, ocean waves, and pure delta brainwave frequencies - the dominant brainwaves during deep sleep. Bonus track - was a prototype version of Sound Asleep. Some of our beta-testers said they wouldn't want to be without this track, so we've made it available as a complimentary digital download. The blend of words and brainwave entrainment technology in these tracks is very potent, and we suggest that you use the principle of "less is more" when you first begin using them. That means keeping the volume at a relatively low to moderate level, and to start by just listening to the first track, once through, for several nights in a row. There's no need to make any effort to fall asleep as you listen. If you just deeply relax the first few times, that's perfectly fine. In fact, the more you learn to deeply relax in bed, the better your sleep will become because you’ll be building a positive unconscious association between your bed and deep rest. With the longer-term use of the tracks, you'll tend to find that you’re falling asleep within a matter of minutes and that the quality of your sleep gets better and better over time. As a father of two young children, I know all too well what it's like to be deprived of sleep for weeks at a time, and how precious a really good night's sleep can be. And as a hypnotherapist, I've seen countless people's lives improve once they overcame the issues they were having with their sleep. It's often said that no matter what difficulties you may be facing, "you'll feel better about things in the morning". Well, once you are experiencing high-quality sleep, that turns out to be absolutely true. After a good night's sleep, it's suddenly so much easier to focus, to feel cheerful and motivated, and to keep everything going on in your life in perspective. So in 2017, I began to feel strongly drawn to create a digital program for reliably inducing deep sleep. I wanted this to be a distillation of how I help my hypnotherapy clients to sleep more deeply, and for it to incorporate the most cutting-edge developments in brainwave entrainment technology. My vision was to create a program of soporific sonic sorcery, where a rich tapestry of gentle words and immersive sounds would guide you, step by step, into deep, slow-wave sleep. After many hours in the recording studio, with over six months of further testing and refinement, I arrived at a set of tracks which I believe fulfills my original aims. My own sleep has improved significantly as I've been using these tracks, which itself has been a great boon, and I'm now delighted to be finally sharing Sound Asleep with the world. 3D processing and gentle, rhythmic panning was applied to every element of the soundscape. This subtly encourages the brain to keep focusing on the sounds, which significantly enhances the power of the brainwave entrainment. There are two layers of binaural beats, phase-locked with each other for a stronger, more coherent entrainment effect. Isochronic sound pulses, with custom designed waveforms, are embedded in the audible sounds. These are reinforced by additional pulses at frequencies which are just outside the threshold of conscious perception (but which, according to studies on auditory processing, the brain still unconsciously responds to). The verbally guided tracks contain entrainment patterns which gently guide you down through the different stages of sleep. The entrainment begins by inducing alpha waves, associated with light relaxation and stage one sleep. It then slowly descends through theta, and eventually reaches the low delta range, which is the most restorative, healing stage of sleep. The music-only track is a broadband delta entrainment track, which oscillates through the complete delta range over the course of the track. This track can be played after the main verbally guided track, or it can be used as a standalone track to promote deep, delta-wave sleep. Joseph Kao, also the creator of Profound Releasing and Profound Renewal is a hypnotherapist and a solution-focused therapist with a private practice in Cambridge, UK. Joseph was the co-developer of an acclaimed course on conversational hypnosis, and he regularly teaches hypnotherapy and psychotherapy to other therapists. He has also been the head scriptwriter for over 800 professional hypnotherapy recordings. If you are not completely impressed with Sound Asleep, let us know within the first 90 days, and we’ll gladly give you a full refund.